Dream Cancel Theater is a re-broadcast show that features random KOF/SNK fighting game gameplay from many different times from all over the world! The Humble Bundle site is currently running a NeoGeo 25th anniversary bundle covering several NeoGeo titles, and additional extras at high enough tiers. This covers the applicable titles already available on Steam, and several others as DRM-free downloads which can also be played on a browser. Notably, on of the available titles is Samurai Shodown V Special, which has never been ported outside the NeoGeo. The tier breakdown is as follows. $40 or more – all of the above plus a Metal Slug t-shirt. 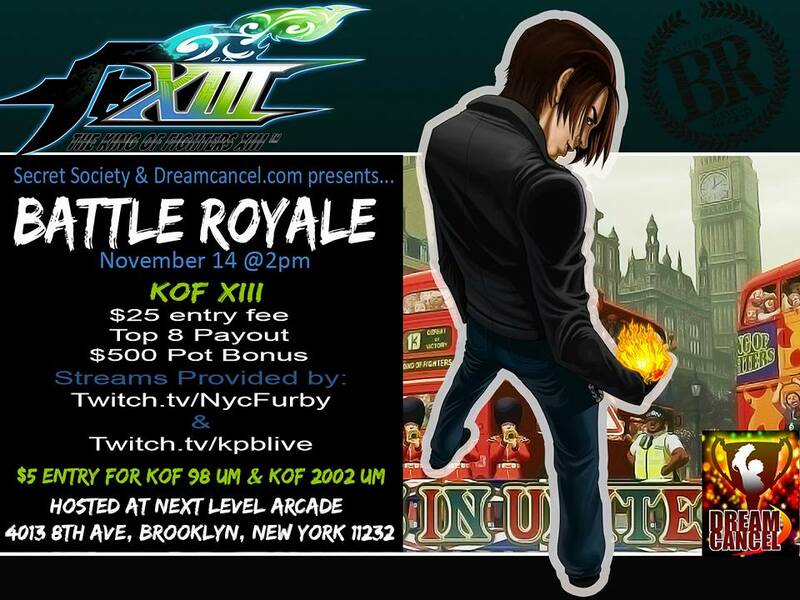 Last night in Brooklyn, NY, was the second high stakes KOF tournament called the KOF Battle Royal II powered by the Secret Society and Dream Cancel! 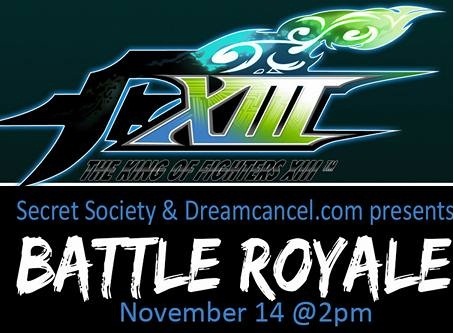 The Secret Society, Dream Cancel, and various members from the KOF community have once again teamed up to create another High Stakes KOF XIII tournament being hosted at the infamous Next Level Arcade, a frequently visited venue of many great players of all games. Arturo “nycfurby” Sanchez of Team Spooky is confirmed to be streaming the event at twitch.tv/nycfurby as well as Team Kick-Punch-Block at twitch.tv/kpblive. In addition, this event is a Dream Cancel Cup Premier Qualifying event for all games in the Finals taking place on January 2016. If you live in the tristate area and or have been looking for a KOF 98, KOF 98UM:FE, and or KOF 2K2UM tournament, then you most definitely do not want to miss out on this event. Check out the thread here and the facebook event page here for more details. If you wanna know what you may have missed out on last year, check out the match below as it capsulizes the hype levels of what is to come. WARNING, video has colorful language (NSFW) so be cautious where watching it. Korea’s Soft Big Bang announced that a collaboration with SNK Playmore. In their upcoming game Core masters, characters from The King of Fighters ’98 will be appear in the MOBA as guest characters. Kyo, Iori, and Athena are available to play today after updates in the Japanese version. Hit the jump for more concept art and trailers! 2.) Post on our facebook page, “98 for iOS”. Winners will be randomly picked, and contacted via Private Message on facebook! Toyama) is proud to announce the worldwide release of “THE KING OF FIGHTERS ’98” for Android devices. for its stellar game balance, is now available on Android and in the days to come on iOS! features for an even better game experience! ◆ The best game balance in the “KOF” series! with Bluetooth game controllers for the best gameplay experience ever!! edit characters return in “KOF ‘98” to complete the gorgeous roster of 38 characters and for a never ending dream match! ◆ A NEOGEO Perfect Port with added features! special moves with the help of the “SP” button! ◆ Challenge your friends via Bluetooth! Stay tuned for more information! The game should be released very, very soon! 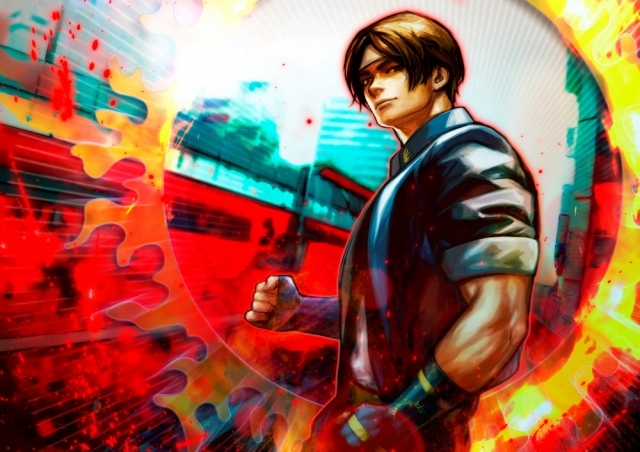 August is going to be a big month for online classic SNK games. First up, Desmond Delaghetto is filling up the weekend of August 13th with his King of Fighters first-to-10 series. On Saturday, The King of Fighters 98 will be the focus. On Sunday, it will be 2002. Check out all of the details in the forum thread: http://dreamcancel.com/forum/index.php?topic=1102.0. The next weekend, steamwolf is running a Fatal Fury weekend. Saturday will feature Real Bout 2 and Sunday is all about Garou: Mark of the Wolves. RB2 is an amazing game and Garou is a classic that every fighting game fan knows and, most likely, loves. The information on the Fatal Fury weekend can be found here: http://dreamcancel.com/forum/index.php?topic=1117.0.